In Renaissance Italy, the birthplace of the humanities, there were people who believed in literature. Not just people who read literature, wrote literature, studied literature, professed literature, packaged and sold literature, as today, but people who really believed in it. They believed that certain old books—containing poetry, history, moral philosophy, drama, oratory—could reshape the souls of the young and remake the state, society, the arts and sciences. They could turn barbarians into civilized people. They thought these books contained the secrets of a long-dead empire, the greatest empire the world had ever seen. These were books that taught you how to be powerful, wise, and good; how to speak so that everyone would be convinced by your words; how to make your city peaceful, strong, and beautiful; how to live in harmony with nature; how to escape the superstitions of folk religion; how to rediscover a forgotten world of the spirit. Those who studied these classic books were said to be engaged in the study of humanity, to distinguish them from others who studied divinity, religious books. 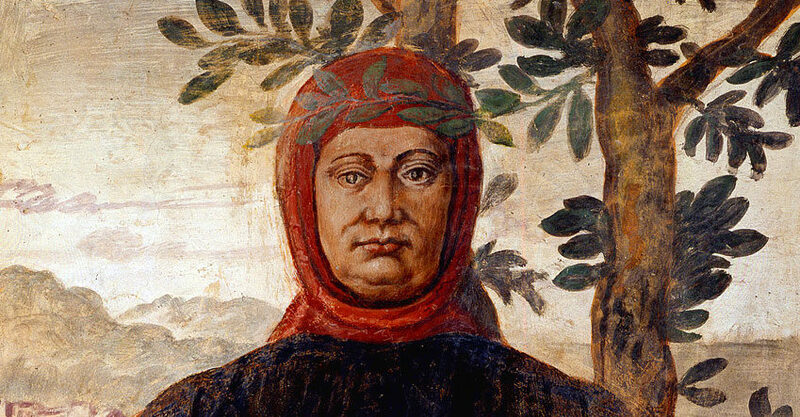 The man who more than anyone else invented the humanities as a coherent program of study was Francesco Petrarch, mainly known today as a great Italian poet. He lived in an age, the fourteenth century, when good men and women despaired of their times. Europe was threatened by the armies of the Ottoman Turks, the rising Islamic power in the East, but Europe’s political leaders, obsessed with their own quarrels, did nothing. The Holy Roman Empire was a powerless sham. Italy was ruled by bloody tyrants. Worse, the religious authorities of the time who set the tone of Europe’s culture were appallingly corrupt. The popes with their courtiers had left the holy city of Rome, consecrated with the blood of martyrs, and gone to live in the gay Mediterranean city of Avignon, where they whored and drank fine wines from Burgundy. All they cared about was money and status. The Church, the greatest financial power in Europe, was under the control of French aristocrats, colluding with bankers and oligarchs in Italy to siphon off her wealth for themselves. Her prelates, charged Petrarch, had grown fat on the leanness of Christ’s paupers. “Nature, fortune, and the custom of the age have rendered you shameless.” The plagues which wiped out a third of Europe’s population after 1348 were surely God’s punishment. Worse still, the fair body of Italy had been ravaged for generations by bands of mercenary soldiers who could only be stopped from rapine and destruction by immense bribes from the towns and cities they threatened. Otherwise, fire and murder. “War without fire is like a sausage without mustard,” said one mercenary captain, famous for his cruelty. In particular, the quality the Romans called humanitas and the Greeks philanthropia needed resuscitation. At its root the term meant kindness, sympathy for others, but its connotations broadened out to signify something like “civilization” or “civilized conduct.” Its lexical opposite was immanitas, barbarity or cruelty. Petrarch thought that the noble humanitas of the old Romans could be recovered by studying the books they had written and taught in their schools. For several generations literary men in Italy had sought inspiration in ancient Latin writings, but Petrarch now redirected their efforts to the reform of human character through the study of classical literature. The movement he created is called “humanism” by modern historians, though it had exactly nothing in common with the anti-religious humanism of modern times. In fact the humanists inspired by Petrarch and later Erasmus and Thomas More saw themselves as helping to rebuild Christendom by returning it to its ancient roots. They believed the study of classical languages and literatures, neglected in the Middle Ages (a period concept they invented), could improve character and create a love for wisdom and true piety. How was this supposed to happen? Character was believed to be a habitus, an acquired disposition that resided within the human soul. To form a good character required effective persuasion and examples of noble conduct. Human beings would not be inspired to return to ancient models of noble conduct by reading the products of late medieval literacy: technical treatises on logic, medicine or theology; works of popular piety; chivalric tales and the bawdy stories of Boccaccio. They needed Plutarch, Seneca, Cicero, Livy, and Aristotle’s Ethics, the last retranslated into eloquent humanist Latin. Eloquence was a key goal. Men of high character were naturally charismatic, the humanists believed, but to communicate their charisma they would need the eloquence of the ancient Romans. The flat, ugly, and impersonal Latin of the schools—like academic prose today—was not going to launch Crusades or govern cities with wisdom and justice. Virtue needed the trumpet of eloquence. So the humanists became philologists, lovers of language, anxious to recover the language arts of antiquity: the art of correct speech (grammar) and the art of persuasive speech (rhetoric). This too required intensive study of ancient literature, especially poetry and oratory, where the ancient mastery of speech had reached its zenith. In due course the humanists realized that the greatest speakers of Latin had gone to school in Greece, so they studied Greek, too. Philosophy added rational argument to history’s examples. The humanists favored moral philosophy above the more abstruse sorts; most of them regarded technical philosophy as a waste of time. But the type of philosophy depicted in Cicero and in the Socratic dialogues of Plato—wise and noble men asking serious questions about how to live—this they saw as useful for corroborating virtue. Philosophy also provided its devotees with a vision of the cosmos in which rational and therefore good human conduct was in harmony with the law of nature. “Live in accordance with nature” was the philosophers’ maxim for lovers of virtue. Renaissance philosophy urged upon the classically educated person a different form of status-seeking than was enjoined by corrupt human society. Through wisdom and goodness one could raise one’s dignitas or rank in nature, wrote Giovanni Pico della Mirandola: one could fly up to the heavens with the angels, or one could descend to the level of the beasts and lose one’s humanity. True nobility came from virtue. Petrarch inspired several generations of Italian literary men who believed in the power of old books. Towards the end of the fifteenth century their movement spread to northern Europe, where it was led by Erasmus and Thomas More. The literati of Europe created a new form of cultivation they called bonae litterae, “good letters,” the letters that made you good, or the literae humaniores, the literature that made you more human. The humanities became an educational tradition which dominated Western schoolrooms for over four hundred years. The arts curricula in European universities and European culture as a whole were gradually transformed by them. Humanism inspired the movement we call the Renaissance, but it remained pulsing through the bloodstream of the Western educational system down to recent times. By the end of the eighteenth century, however, its fundamental assumption, that guidance for life could and should be found in antiquity and could be accessed through knowledge of ancient languages, was being swept under by the rising belief that individuals and societies could and should create new modes of living, enabled by science. We should progress towards a future we have chosen for ourselves, fulfill our potential, remake ourselves as individuals, “raise up on high the pyramid of [our] existence,” as Goethe put it. Or we should march shoulder-to-shoulder in equality towards a more just society. To teach conformity to models of conduct inherited from an outworn, feudal past was worse than merely retrogressive. It was to keep mankind in slavery. Educational practice is always conservative, however, and it took more than a century for the gospel of Progress to dislodge the traditional humanities from the schools. But fast-forward now to the twenty-first century, to the present “crisis of the humanities.” Modern commentators have deplored a crisis of the humanities for at least four decades. With each passing year, it seems, the humanities become ever more marginal inside the academy and outside it. At my own university, Harvard, the percentage of entering students who say they want to study humanities has fallen from 30 percent around 1980 to less than 15 percent today, despite efforts in the admissions office to admit disproportionately more students for the humanities. New teaching positions in the humanities have become rarer, especially in the last few years. Teachers of the humanities seem unable to convince either students or administrators (to say nothing of state legislatures) of the value of what they teach, and attempts to reshape the humanities to promote political or cultural agendas have only succeeded in dividing humanists among themselves and arousing the active hostility of their natural enemies. But why are the arguments of modern humanists for the value of their own discipline so weak? The answer lies in what the humanities have become since the nineteenth century. The traditional humanities curriculum inherited from the Renaissance, centered on classical literature and moral formation, came under attack in the United States in the second half of the nineteenth century, an attack led by Charles W. Eliot, president of Harvard. Eliot, a chemist by training, founded the “elective system” in the belief that modern students needed more freedom to choose their own educational paths. Literary study could no longer be valued as a unique initiation into civilized values but should become just another subject matter, just another menu item in the buffet of educational choice. John Dewey, the leading Progressive educational theorist of the twentieth century, held that education should be completely reshaped. It should no longer force children to master dead languages but engage them in “active learning” relatable to their daily experience and growth as social beings. It should not focus on acquiring a fixed set of facts, but should aim to help students learn creativity and self-expression, using their chosen skills to effect social change and democratic reform. As the research university took shape in late nineteenth-century America, the humanities could only survive by emphasizing the aspect of their tradition most capable of professionalization, namely philology: the history and science of texts.3 The humanities split up into a welter of disciplines and departments. By the end of the Second World War the original rationale for the study of the humanities had dropped down the stream of history. If in our time some new Erasmus should arise and try to articulate it, most educators would surely respond with blank incomprehension, hostility, or ridicule. Unquestionably it is hard for most people in the twenty-first century to look on the traditional humanities with much sympathy or to see much relevance to present concerns. Latin grammar and rhetoric? Latin today retains a certain snob value, but is mostly irrelevant to educated discourse; even professors of classical languages often lack full command of its subtleties. Sadly, the majority of language experts in the modern world see the attempt to distinguish good usage from current usage as deeply undemocratic, and the word “rhetoric” carries a strong negative charge in contemporary culture. Courses on rhetoric, once staples of college curricula—one was required at Harvard College as late as the 1950s—have long been abandoned in the universities. Today, even so rigorous a defender of the liberal arts as St. John’s College in Annapolis would not claim that college curricula should consist entirely of the study of classical authors in original languages. Even the handful of countercultural programs in American high schools that describe themselves as offering “classical education” do not go so far. Few teach much Latin, fewer Greek. It’s clear that any attempt to revive the humanities in anything like their premodern form would turn out, at best, to be a kind of quixotic antiquarianism, at worst the obsession of Dr. Dryasdust. The substantive fields of the traditional humanities—history, poetry, moral philosophy—are today in the hands of professors. Their function is no longer to nurture humanitas, promote virtue and wisdom, or kindle a sympathetic loyalty to the best in our civilization. The older generation of professional academics see classic books as a field for quasi-scientific research. Making “contributions to knowledge” to be read by other professors within their discipline (or rather by a small coterie within their discipline) is the center of their professional life. At best such professors might see themselves as providing their students with literary pleasure or the fun of intellectual problem-solving or “cultural literacy.” By reading old books students become citizens of the globus intellectualis, able to recognize allusions which pass over the heads of others. This skill feeds their sense of being “smart” (the new code word for “elite”), superior to the uneducated or, shall we say, the differently educated. Knowing about classic books is a kind of geekiness that is widely admired among the young, but its moral effects are limited, possibly even negative. To be clear, teaching “cultural literacy” is never to be deplored. Knowledge is better than ignorance. But it should not be confused with the deeply transformative effects on mind and character sought in traditional humanities education. More to the point, a set of disciplines that produces know-it-all students taught by hyperspecialized research drones, manufacturing unreadable studies of interest to no one but themselves, is not in a good position to make claims on the resources of society at large. Serious scholarly research in the humanities can be a noble calling, and it does serve important civilizational ends; it ensures an accurate memory of our past. But the way humanities research is produced and evaluated in universities today too often is unmoored from any larger moral purpose. University professors, to be sure, have other ways to defend the humanities. The more politically minded professors use old books as a corpus vile for the exercise of what Paul Ricoeur called “the hermeneutics of suspicion.” They are texts whose surface meanings need to be unmasked and exposed as the poisoned fruits of a corrupt socioeconomic system, or of racism, sexism, and other approved targets of moral opprobrium. Reverence for old books is suspect. To foster an attitude of respect for classic texts merely serves the dominant social class; it supports a hegemonic ideology perpetuating the interests of that class. On this view, the traditional humanities are hardly more than a complex form of socialization designed to justify elite claims to power. The old educational system that aimed to teach eloquence and virtue must have “really” done so in order to legitimate the social and political power of the educated. It perpetuated the values of the elite by presenting them as normative or natural. Such politicized exercises in the hermeneutics of suspicion thus act as prophylactics of the soul, preventing readers from receiving or being changed by what classical poets and philosophers had to say. They cannot undergo the psychic midwifery of Socrates or respond to his call for true virtue without feeling guilty about their complicity in oppression. In more practical, student-minded terms, radical hermeneutics allows students to reduce classical literature to a few names and easily learned buzzwords, before getting on with the next assignment. Which raises the question: Why should students immerse themselves in what the ancient authors actually wrote (and in Latin and Greek, no less!) when their teachers have already dismissed those authors as toadying mouthpieces for The System? Why spend long hours reading a difficult text when consulting Wikipedia is all you need to impress others with your theoretical sophistication? Some radical professors have belatedly realized that politicizing the syllabus in this way has the long-term effect of destroying their own disciplines. Once all the statues have been toppled, once all the portraits have been taken down, there is no more work for iconoclasts. Why go on reading old books once they have been exposed? The spectacle of radical professors trying to justify their own existence is an unedifying one, even mildly comic. They try to change the canon to embrace more radical texts. They change literary theories, replacing old models with the latest French or German imports. They pride themselves on teaching “critique,” the risible claim that exposing malign political subtexts in Jane Austen will help their students decode more effectively the myths of modern politics. But the humanities do not flourish when used as instruments of partisan politics—especially when you have to find donors to support faculty positions, or when your side loses the election. The sad truth is that politicizing the humanities by critiquing past authors has not produced the radicalism that it originally proclaimed. The politicized humanities summon the past before today’s students only to subject it to ritual criticism from the enlightened standpoint of the present. Reading old texts in this guise has produced the very degeneracy that it set out to challenge. The humanities which supposedly served the powerful of the past now, through their critique, serve the smugness of the present. To be sure, the treason of the clerks is only part of the reason the humanities are dying off in higher education. Much has to do with the gradual spread of vocational education within even elite universities, mirroring the materialism of American society, and the consequent tendency to regard the humanities as relatively inexpensive luxury goods: enjoyable, undemanding, but without much cash value. Majoring in literature or philosophy will not improve your chances of employment, and the future income stream of economics majors or engineering majors is vastly in excess of what the average English major can expect to earn. So the humanities are defended as vaguely “enriching”; they promote the life of the mind and enable graduates in later life to enjoy museums and concerts and lectures. All this is no doubt true and of real value to those of us who have had the benefit of a humanistic education. We are grateful for what our teachers have given us. But the average state legislator, who is less likely to sympathize with humanistic education, is going to ask: What do the humanities contribute to the economy? Why should the taxpayer pay for a luxury good? Why should I fund a tool of my political opposition? Parents who send their children to university, hoping for them to enjoy a better life—“a better life” that is most often understood in material terms—will hear with alarm that their child intends to major in Women’s Studies or Folklore and Mythology. They are paying out their life savings so that their children can entertain themselves, make themselves unemployable? Professors tend to keen with impotent rage against unsympathetic state legislators and to smile condescendingly at parents concerned with the job prospects of their children. Neither response, however, does much to increase understanding and support of the humanities. Some humanists, however, have begun organizing to prevent further losses of political and financial support for the humanities. This means defending the humanities in terms that can be understood by the lumpen politician or by anxious parents. A fairly typical example of this approach to defending the humanities is an international initiative called “4Humanities,” a web-based group that describes itself as “an international initiative for advocacy of the humanities, drawing on the technologies, new-media expertise, and ideas of the international digital humanities community.” Its membership is drawn primarily from Anglosphere academics in small liberal arts colleges and in state-funded universities, those most threatened by the decline of humanities funding. Among other things the group monitors public discourse about the humanities in Washington, D.C., in state legislatures, and elsewhere with a view to offering constructive responses to misperceptions. It tries to make positive arguments for humanistic studies that can register below the empyrean realm of the wealthiest private universities and European research institutes. A visit to the websites of this organization and its affiliates shows what they consider effective marketing in today’s environment. There are, broadly, two lines of defense. One is to emphasize the skill sets and financial payoffs that an education in humanities can produce. An infographic published by the organization, with the rather shrill headline “The Humanities Matter!”, informs us that humanistic study teaches us “how to deal critically and logically with imperfect information.” Students are said to learn effective oral and written communication, problem-solving skills, and the empathy and cultural understanding necessary to work in large, diverse organizations. Evidence is said to exist that employment opportunities for arts, humanities, and social science graduates are as good (or even better!) than for graduates in natural sciences and technology. Sixty percent of chief executives in corporations, it is claimed, had degrees in the humanities. Furthermore, underinvestment in language skills is said to cost the British economy £9 billion annually, while universities there are said to contribute £45 billion to the economy. Yet despite these wonderful benefits to business, government, and the economy, the U.S. federal government only commits 0.45 percent of research money annually to the humanities, and even the presumably more enlightened Europeans commit only 1.06 percent of their research budget to both social sciences and humanities. The message is unsubtle: Take our courses! Fund us! It will pay off! The second line of defense now being offered by the humanities, especially in the last decade, is far more sophisticated and rests on serious historical research as well as a growing digital infrastructure. The strategy is essentially to claim that the line drawn between the humanities and the sciences in modern academic culture is a recent and misleading one. The humanities have always been scientific in character, made important contributions to science rightly understood, have inspired innovation in the natural sciences, and are today engaged more than ever in advanced scientific, computer-aided research. Current scientific research in the humanities, commonly referred to as “digital humanities,” relies on Big Data and stands at the forefront, as the Alliance of Digital Humanities Organizations claims, “of areas such as textual analysis, electronic publication, document encoding, textual studies and theory, new media studies and multimedia, digital libraries, applied augmented reality, interactive gaming, and beyond.” We do more than just teach Dante and Jane Austen! Major research universities, the National Endowment for the Humanities, and private foundations like the Andrew W. Mellon Foundation, formerly known for supporting high-quality scholarship, have been pouring money into digital humanities. The ability to use digital teaching and research methods is rapidly becoming a compulsory credential in the portfolio of young humanities scholars eager for promotion. Perhaps the leading mover and shaker in the movement to repackage the humanities as sciences is Rens Bod, a professor at the Institute for Logic, Language and Computation at the University of Amsterdam. A specialist in the computer-aided study of linguistics and musicology, Bod is a powerful analytic thinker, competent in many languages, whose A New History of the Humanities: The Search for Principles and Patterns from Antiquity to the Present (Oxford, 2013), rather surprisingly, is the first comprehensive history of the humanities. The book deserves a more detailed review than can be given here, but its major claims can be sketched as follows. Humanistic disciplines (or disciplines now labeled as humanities) have since antiquity invented powerful methodological principles to discern patterns in the “expressions of the human mind” such as literature, art, music. Those principles and patterns were elaborated in disciplines such as linguistics (grammar), philology, historiography, art theory, logic, rhetoric, and poetics. There is no good reason not to regard these disciplines as sciences in the full sense, and historical study reveals that the figures identified as natural scientists in modern histories of science were always involved in, and frequently inspired by, the wider humanistic sciences of their day. In other words, the progress and scientific innovations of the West and of other cultures have always depended on humanistic research, working in concert with what would be described more narrowly today as scientific research. And that situation remains true even in our time. Bod sees the value of the humanities in their contributions to innovation and progress, and attaches little or no importance to the moral ends of humanistic study as they were traditionally understood. He even goes so far as to claim that the attachment of humanistic philology to texts such as the Bible or the great classical authors was in certain respects and at certain times retrograde for the advance of humanity. This de-moralization of the humanities, this indifference to older civilizational values, is a tendency Bod shares with other modern defenders of the humanities. To be fair, a deeper dig into the 4Humanities and digital humanities websites will reveal that many modern academics still appreciate the real humanities, the humanities some teachers and some students still love. They know the soul of the humanities is prolonged contact with the great literature and philosophy of the past, the integration of the young into a cultural tradition, the discovery of the self in the mirror of great minds. They know that to defend the humanities by selling only the extrinsic benefits of humanistic study sells them short. But they no longer believe that the real goals of the humanities can be explained in so many words to those who today control the university’s purse strings. They think they have to use the camouflage of science, technology, and economic productivity to preserve public goodwill for their vocation. Whether they will succeed is open to doubt. The Western tradition has been here before. In the High Middle Ages, from the late twelfth century to the early fourteenth, university teachers also tried to convert the study of canonical authors into a package of pre-professional skills. They turned grammar into linguistic theory and rhetoric and poetics into practical, how-to handbooks. They stopped reading the classical authors for their own sake. The moral vacuum that resulted is the main reason why humanists like Petrarch began the renaissance of the ancient authors in the late fourteenth century. De-moralizing the humanities—turning them into a set of skills, into a training in empathy, into politics by other means, or into handmaidens of the natural sciences—is a misguided strategy. Their moralizing purpose will always flow back in. The best way to disrupt the current pattern of decline in the humanities is to return them to their original, now discarded purpose of challenging cultural complacency by holding aloft what is best in our civilization. But can the humanities learn again how to make a moral argument for themselves? That depends, I believe, on whether what they teach is worth defending. As a classical rhetorician would have put it, it depends on the circumstantiae: who is making the argument, to whom, and the nature of the case being argued. If the goal is to save our jobs, we should by all means retrain and jump aboard the digital humanities bandwagon. If the goal is to save our civilization, however, the road ahead will be more difficult. It may not be possible for teachers of traditional humanities to find support much longer in the universities, given current attitudes there. It may be that the traditional humanities must seek places outside or on the periphery of the university, in programs like the ones run by the admirable Paideia Institute or in independent “Great Books” programs. This would not necessarily be a bad thing: it would mean returning the humanities to their roots, since the studia humanitatis in the Renaissance began as a movement outside universities and only gradually found support inside what previously had been, for the most part, illiberal, preprofessional institutions. Modern universities are institutions driven above all by the need to accumulate prestige. If humane letters are taught in an inspiring way outside their orbit, if they start producing impressive leaders again, men and women who defend what is good with elegance and power, it can be only a matter of time before universities will be obliged to form a new and higher estimate of their value. Much more important than where the humanities are taught is what they teach. Those who understand and value the traditional humanities need to make the case for them in morally serious and nonpartisan language. They need to show how the humanities keep alive in the present the best of our past. They need to demonstrate why it is important to remember the great achievements of Western civilization as well as its failures. They need to dispel the canard that traditional humanities teaching inculcates uncritical acceptance of every opinion (many of them certainly noxious) espoused by writers in the Western canon. It is a serious misconception, in fact, to believe that humanities teachers in the past ever studied their classical authorities passively, with unquestioned belief. Even in the Renaissance itself—especially in the Renaissance—humanists always encouraged readers to exercise their own moral and spiritual discernment when reading old books. In the Renaissance and early modern period they took great pains to align what they read in pagan authors with their own moral, political, and religious commitments. That was how the humanities understood the admonition of the Delphic oracle to “Know Thyself.” There were always active debates about which aspects of pagan piety might be admirable and worthy of emulation by Christians; whether and to what extent the lives of Cicero (accused of abuse of power) and Seneca (accused of serving a tyrant) deserved approval. An intense argument continued for centuries as to whether Caesar was a tyrant or the strong and wise ruler Rome needed to end the corruption of the old republic; whether Augustus’s transformation of Rome into a monarchy was necessary or a catastrophic betrayal of Roman traditions. Praise and blame, the chief topics of Renaissance rhetoric, were tools of moral discernment. Down to modern times the study of classical literature, history, and philosophy was always linked to moral evaluation. Humanists always understood that antiquity was full of moral degradation and error as well as heroic virtue and sagacity, but they also thought that ancient men and women had qualities of nobility and wisdom that were missing or rare in their world. They are even rarer in ours. And they have never been more needed. At their origin in the Renaissance the humanities were not just a collection of old books studied by antiquarian enthusiasts. They emerged on the scene to challenge what they saw as political, cultural, and educational degeneracy. From the beginning—and perhaps never more than now—the justification of humanities lies in the fact that they have always been poised to expose the soulless routine of our education and the moral complacency of our elites. Today, the left-political critique of the past can no longer claim to be revolutionary. It has become dull and predictable; it asks questions to which we already know the answers. Whether the humanities endure within the university or take a step outside, they will retain their original potential to slow corruption and to ennoble our world by rallying educated people around the praiseworthy conduct that is now in short supply. Why is this? The reasons why the humanities can exercise this power may seem counterintuitive, but they constitute the core of the case for the humanities. The first involves the simple merits of language study. The basis of all the ethical systems, first discovered by the thinkers of the Axial Period in antiquity—by Confucius, Socrates, the Buddha—was the teaching that other people, beginning with our family, friends, and country but extending ultimately to the whole of mankind, deserve our help and sympathy. The great moral traditions of the human race teach not merely that we should do good to others with the calculation that they will reciprocate, that one hand scratches another. They teach the value of selflessness in the Buddhist sense, the filial piety and natural sympathy among men taught by the Confucian tradition, the Socratic doctrine that it is better to suffer than to do evil. We can and should substitute sympathy for self-interest; we can cooperate as well as compete. Cooperation requires trust, understanding, and empathy, and these are impossible without language study. They depend on precise standards and the correct use of our own language. They depend on the power to understand someone else’s speech in their own language and to translate that speech accurately into one’s own. This is a basic necessity of human social life and it is a scandal that the modern humanities do not attach a higher value to it. Second, the value of eloquence. Sometimes, when listening to recordings of orators like Winston Churchill or John F. Kennedy, or when we read the speeches of Abraham Lincoln, we become acutely conscious of the absence in our own political culture of eloquence, of convictions forcefully and beautifully expressed. We have recently in America had many proofs of how imprecision of expression and unconcern for one’s own ethos or moral personality can poison political discourse. The study of writing should teach more than how to write a clear and polite business letter. As good writers know, writing is a moral exercise, a form of self-knowledge. If we are honest in writing we come to realize our own intellectual and moral shortcomings. If we have any good in us, if we have things we believe in, we need the arts of writing and speaking to communicate them. Bonum diffusivum sui. What is good needs to be passed on. As political consultants know, the most powerful arguments are always moral arguments. Leadership is most effective, perhaps only effective, when leaders have moral weight and eloquence. Even for writers not called upon to lead, the cultivation of eloquent speech and writing is a valuable moral discipline. True eloquence, as Cicero wrote, comes from the good man skilled in speaking, the vir bonus dicendi peritus. When we write or speak well, we show what we are. Since human beings naturally want to be loved rather than despised, the aspiration to correct and powerful expression becomes a school of character. Just as real teaching, teaching that cares about the character of the taught, requires the teacher to be morally good as well. Finally, a case for the traditional humanities has to include a reorientation of teaching towards the formation of character and judgment. In the study of literature, history, philosophy, and the arts we need to abandon the refusal to make “value judgments” characteristic of demoralized modern culture. We need instead to teach a more courageous sort of discernment: to declare what is good and bad in our arts and our literature, to defend our convictions about the best way to live. Renaissance humanists always insisted that full humanity and dignity, true nobility, went beyond wealth and status, beyond a successful career. It mattered what you were more than what you seemed to be. Your character, as David Brooks has recently argued, is more important to your happiness than your résumé.4 The old Christian humanists believed that receptive reading of classical authors—reading built on respect for tradition—would help students see what was truly admirable and worthwhile in human life. Like the young Marcus Aurelius, they could not help but admire noble souls and want to be like them. Where this door has been closed to contemporary students, it must be reopened—not for the sake of praising the vices of the past, but for finding models that we need to emulate. That sort of response, I venture to affirm, is still possible, and it is still necessary. In our time, as in all times, the voices of Vanity Fair shout at us that if only we have enough wealth and power we can get everything we want and can force others to do our will. The voice of uncivilized humanity, in other words, teaches us to be sociopaths. The voice of the old humanities, which is the voice of the best in our civilization, teaches another lesson. It teaches that our life is more valuable when we care about the sort of person we are becoming, when we learn to love what deserves to be loved, when we are admired by people whose good opinion is worth having. It prevents us from becoming ideological puppets of the powerful, it defends us against the sham values of commercialized culture, and it gives us a center that is our own. It makes us, in a word, humanior—more human. 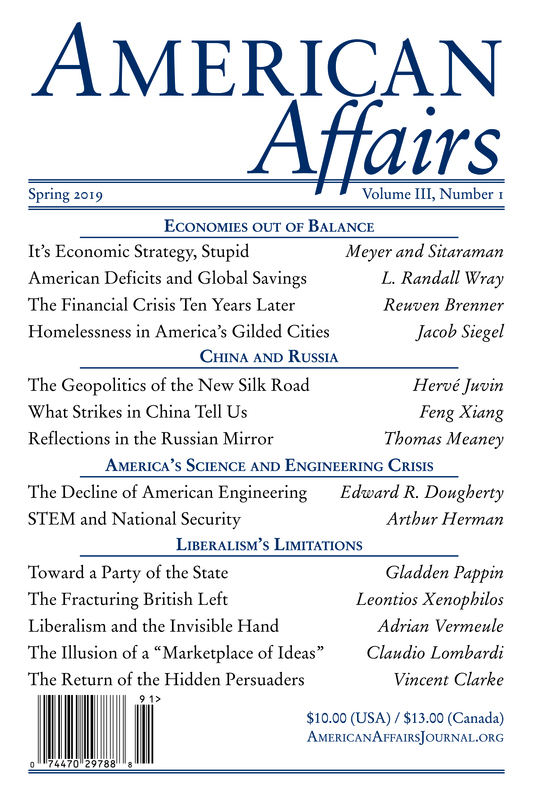 This article originally appeared in American Affairs Volume I, Number 4 (Winter 2017): 193–209. 1 Francesco Petrarca, Selected Letters, trans. Elaine Fantham, 2 vols. (Cambridge: Harvard University Press, 2017), 2:535–37. 2 Lord Chesterfield’s Letters to His Son and Godson, Selected, ed. Henry H. Belfield (New York: Maynard, Merrill, 1897), 13. 3 See especially James Turner, Philology: The Forgotten Origins of the Modern Humanities (Princeton: Princeton University Press, 2014). 4 David Brooks, The Road to Character (New York: Random House, 2016).